J.B. Priestley’s second Postscript radio broadcast began “I don’t think there has ever been a lovelier English spring than this one, now melting into full summer”. In one of the most beautiful of his many descriptions of his beloved English countryside, Priestley evoked the loveliness of the flowers, the birdsong, and how unreal it all felt against the news of war. Yet these things were as real, and would endure long after the madness of war was over. He ended the piece by comparing, as he had done in the first Postscript, the Nazi approach with the English. He had recently seen Nazi propaganda film, Baptism of Fire, and thought it to be all bullying and force, in contrast to the lighthearted humanity of the recent British effort, The Lion has Wings. Priestley emphasised that the Nazi approach did not allow for the greatness ordinary people could achieve, and that this would be their downfall. 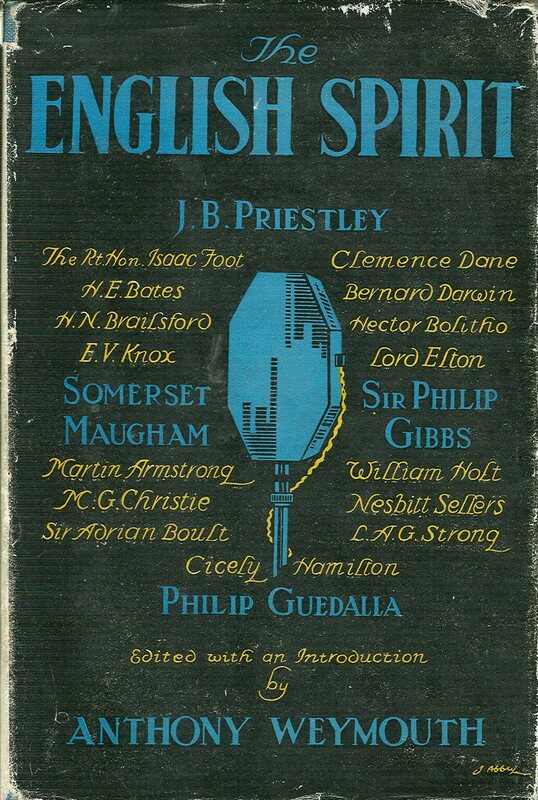 This image shows the jacket of The English Spirit, published in 1942 by Allen and Unwin. It is an anthology of radio talks broadcast by the BBC’s Empire Service, including one by Priestley, This Land of Ours, which clearly dates from May or June 1940. As in the Postscript, Priestley began with the beauty of the spring. The description is as beautiful and evocative as the one in the Postscript, though Priestley chose different flowers and views to make his point. He then continued to explore a theme that runs through so many of his works: the English character. As already mentioned in several blog posts this year, the 75th anniversary edition of J.B. Priestley’s “English Journey” (Great Northern Books) is attracting plenty of interest around the country. Nottingham Evening Post Tuesday 4 August Stewed tea, football, and Goose Fair. Leicester Mercury Tuesday 25 August Priestley’s views on hunting, what he considered to be Leicester’s lack of atmosphere, and slipper problems. Yorkshire Post 12 September. Revisiting Priestley’s Bradford. There have also been reviews in the Eastern Daily Press (Norwich), Lincolnshire Echo, Evening Post (Bristol), and Lancashire Evening Post, and 5 London magazines: Angel, Resident, Grove, Clapham, and Northside.